The Chakra Dragons were painted to promote awareness of the healing qualities of colours when used with the focus on the chakras. The Chakras are energy points found throughout the body. I have focused on eight major chakras found down the center of the head and body in alignment with the spinal column. Each chakra controls a section of the body and its functions. Each has a colour, an emotion, and a note to resonate to. The dragon symbolizes power. I use it to represent willpower or the spirit within. 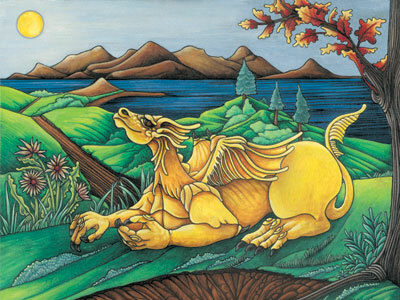 In these paintings my coloured dragons characterize each chakra and their positive meanings to be used visually by anyone to enhance balance and healing. The entire Chakra series of Cards is $29.00. Single cards are $3.75 each, but if you order a selection of 4 cards, it is $12.00 Prints are priced at only $8.00 each. The Magician is bringing down the Dragons. 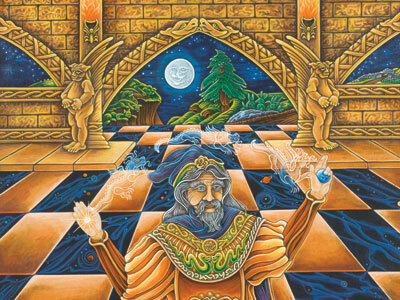 The Magician we become when we believe. The power we get when we combine the dragon spirits of body, mind, and soul. It is like magic when we manifest the power of belief and create. What once was a dream now becomes reality. Castles in the air can find ground. 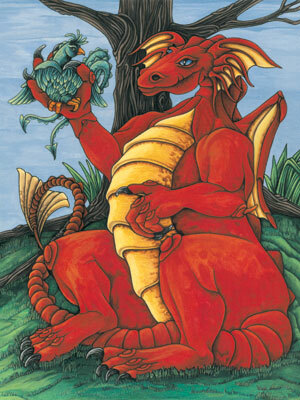 The Red Dragon represents will power, rooting or grounding, and strength. The colour red is good for assertiveness and is the positive action/side of anger. Red Dragon rules the sciatic & pelvic areas, as well as the hands & feet - making it a great energizer! Even in flight one has to alight to contact the ground. Red Dragon is like the roots of a tree reaching down into the earth to hold ground. This dragon is firmly planted offering support for that above. The Orange Dragon represents vitality, movement, and all forms of activity. The colour orange is good for sexual energy - the same energy used to stimulate creativity. Orange Dragon rules the skin, reproductive organs and organs connected with the movement of body fluids - increases circulation. This dragon moves about taking in the beauty of life surrounding and blends in, becoming a part of it. The Yellow Dragon represents the solar plexus (energy centre) influencing thought & learning, languages, changes to be made, as well as digestion. The yellow colour is sun energy and is courage – the positive action/side of cowardice. Yellow Dragon rules the muscles, digestive tract, liver & gall bladder, and pancreas. This dragon guided by intellect and emotion, carefully watches & waits - planning for the right moment to choose direction and then create change. Good food for thought is a priority! 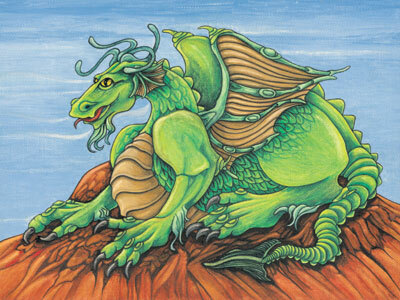 The Green Dragon of well being represents love, balance, good health and wealth - of mind, body & soul. Green Dragon rules the heart area, how we use our energy in giving & receiving - feelings towards others. The Green colour promotes a healthy attitude – the positive action/side to jealousy or envy. 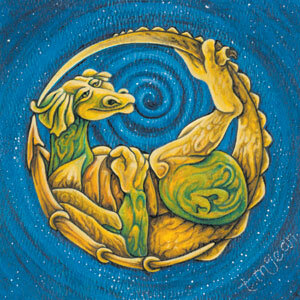 This dragon sits balanced, green like nature, content “on top of the world.” Dragon has sufficient, so feels at peace and in harmony with life. The Turquoise Dragon represents the life and healing energies of the immune system protecting against dis-ease. Turquoise Dragon rules the thymus gland responsible for the T-cells and the lymphatic system that fights illness and stress in the body. Fight not flight moves the intruders out through the body’s fluid. This dragon waits, poised with the balance of green and the healing of blue, to guard against any unhealthy invader and preserve well being. 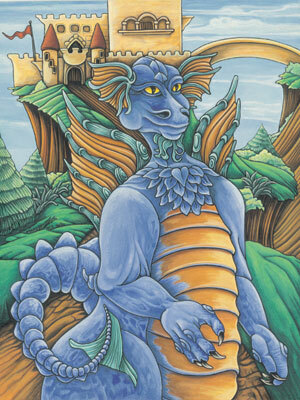 The Blue Dragon represents sound, communication, the soul (inspiration), healing, and peaceful resolve. Blue Dragon rules the throat and neck area. This dragon listens to the soul, combines it with sound, and its voice speaks of wisdom learned. The colour blue is cool & calm, good for communication, and is the positive feeling/side of depression. This dragon eager to help & heal others wastes no time to go out and get things done, bringing matters out into the open. The Indigo Dragon represents the third eye and its ability to look inwards, whereby it combines truth, knowledge, and timing to become the key to intuition for the soul searcher. Indigo Dragon rules the eyes & ears, pineal gland, brain, nerves and pain. 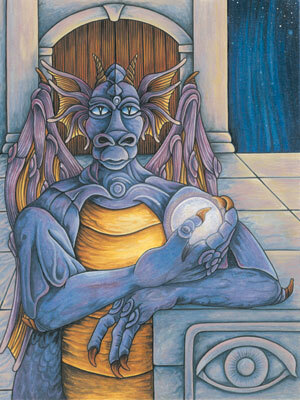 This dragon with its insight holds the light out to those that that seek and wish to see beyond the physical and its limitations - the inner voice of reason of the higher self. 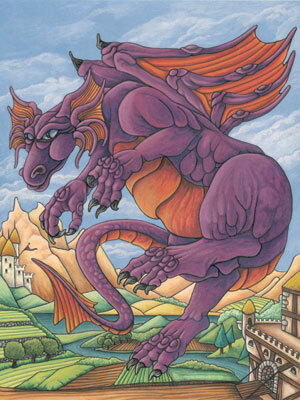 The Purple Dragon represents the crown, the mastery of the mind - gained through enlightenment or spiritualism. Purple Dragon rules the pituitary gland influencing the mind & body to rise above the restrictions of materialism. This dragon has faith and trusts its ability to manifest the power to overcome restrictive boundaries, to venture outside them, and explore the infinite spaces above & beyond. The Dragon Moon represents the female spirit/energy, the inner being of oneself. She has the “insight” ability that combines intuition with the subconscious. 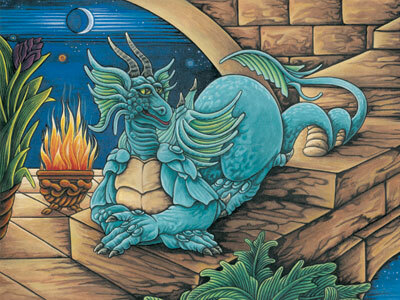 Dragon Moon uses the gentle & passive approach to life when guiding the masculine energy of action. Combining good thoughts with action brings balance to the inner & outer worlds of being. 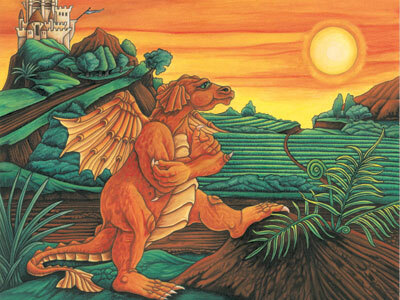 The Sun Dragon represents the male spirit/energy, the outer conscious being of oneself. He has the “strength” to manage physical tasks. 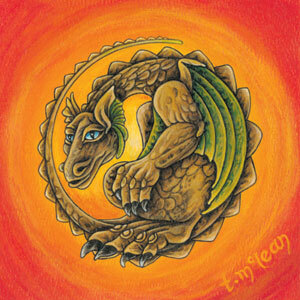 Sun Dragon is assertive action in motion when in touch with the feminine energy. Dragon’s positive action is fast & accurate which maintains the balance from the outside in.